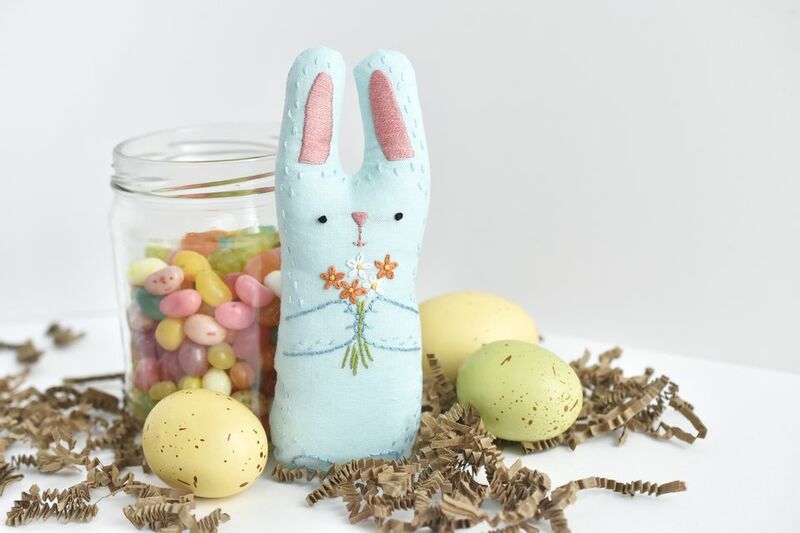 Adding something handmade to an Easter basket makes it extra special, and when that handmade item is a child's own Easter Bunny, it's even better! Make this embroidered bunny stuffed toy with simple stitches and easy sewing. The embroidery and sewing on this doesn't take very long, and it would even be suitable for an older child to make. After you make a bunny or two, try one of these other fun Easter embroidery projects! Download the JPG Bunny Stuffed Toy Pattern. Print the pattern at 100% on standard paper. Trace or transfer the features and details from the bunny pattern onto the fabric, leaving at least 1" between the front and back pieces. Do not trace the outline of the bunny shape yet. Embroider the transferred markings with whatever colors you want, choosing colors that coordinate with your fabric. The sample uses DMC 760, 721, 725, 471, 597, 598, blanc, and 310. Stitch all of the fur with straight stitch. Outline the paws and mouth with back stitch. Use stem stitch for the flower stems and detached chain stitch for the flower petals. Embroider the ears and the nose with satin stitch. Use french knots for the eyes, flower centers, and to fill in the tail. Work with three strands throughout most of the design and use six strands for the french knot eyes. Remove the embroidery pattern markings. Cut out the bunny shape pattern piece and place it on the wrong side of the embroidered bunny front. Trace around the template with a pencil. Mark about 2" on one side to leave as an opening. Place the embroidered front and back pieces together, making sure that they line up. Checking the fur stitching on the ears and at the bottom make this easier. Sew around the bunny shape by stitching on the marked line. Make sure you leave an opening and back stitch at the beginning and end. Clip the curved edges as shown to reduce bulk and keep the curves smooth. Take care that you don't accidentally snip the seam! Turn the bunny toy right side out and use a chopstick or the handle of a child's paintbrush to push the seams open. Fill the bunny with stuffing. Add the stuffing in small pieces, filling the ears first, the bottom next, and finishing with the middle. The bunny should feel firm, but not overstuffed. Fold the seam allowance in by the opening and start stitching it closed. Use regular sewing thread and slip stitch or ladder stitch to sew it by hand. Take small stitches on each side of the opening and then pull the thread to draw the sides together. Hide the knots in the seam as much as possible. Share Your Bunny Toy With Someone Special! Your stuffed bunny toy is all finished now and ready to hop into an Easter basket or receive some springtime snuggles! Instead of stitching the flowers, leave them off or change them out for another item so your bunny is useful all year round. Enlarge the pattern to make a big bunny toy or make several sizes to create a family of bunnies. Use either the front or back of the bunny as a regular embroidery pattern, stitching the template outline around the details. Have fun with it and share your bunny toy with someone who will give it lots of love!